I am so anxiously waiting to hear what Republican VP Nominee Sarah Palin has to say tonight. I am hoping she really sticks it to everyone who has been bashing her and her family the last several days. I mean, who are we to judge some one else? Life happens. Her daughter is not the first 17 year old to be pregnant, nor I am sure will she be the last. I get so tired of people criticizing others when they have never walked in their shoes, kwim? I don't mean to suggest that no one is entitled to their opinion, I understand this affects people differently and raises concens. But what I think is uncalled for are the snarky tabloids and late night fodder that basically hurts their whole family. As Obama says, I think the families, especially the kids, should be off limits in the election. I know some say then Ms. Palin should not have entered the election at all, if she wanted to protect the privacy of her family, and that is true enough. 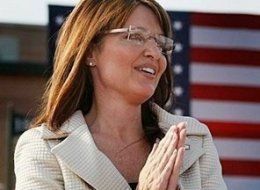 But maybe if Sarah Palin hadn't accepted McCain's offer to run with him in the presidential elections, Palin's daughter would always feel that she kept her mother from potentially being vice president of the United States. I see Sarah Palin as having a lot of courage to stand up and face a criticizing public, and I believe she is a strong woman and a strong mom.